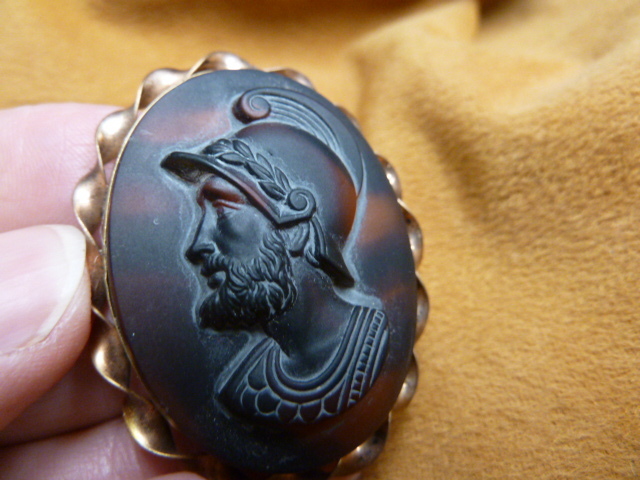 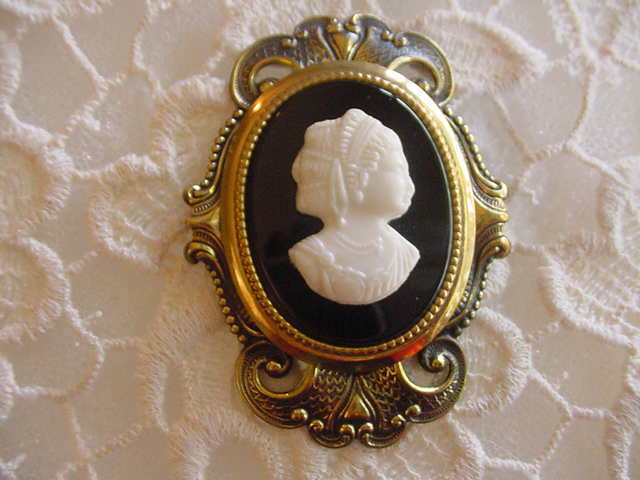 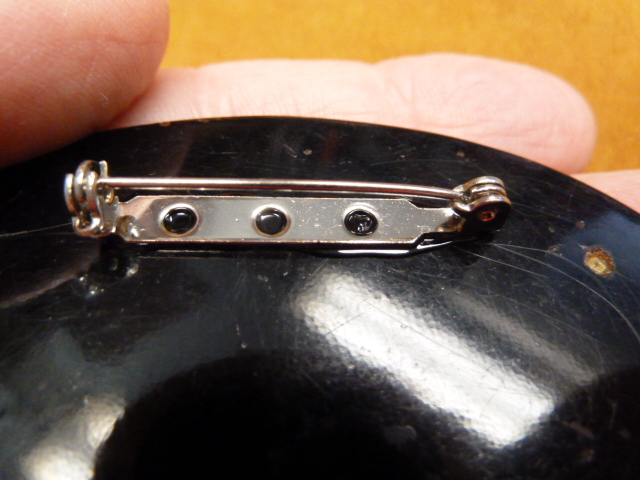 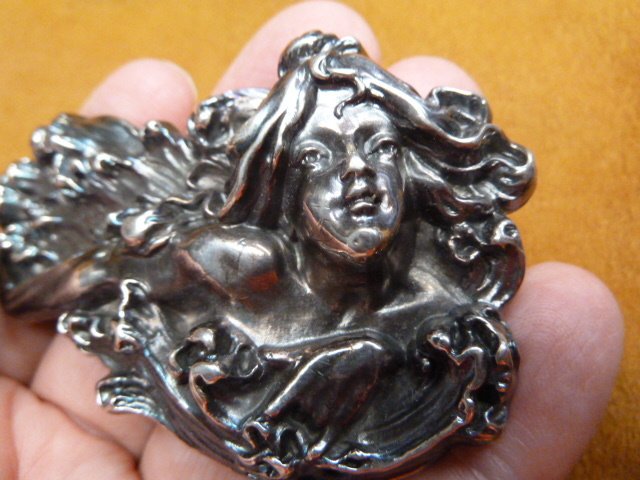 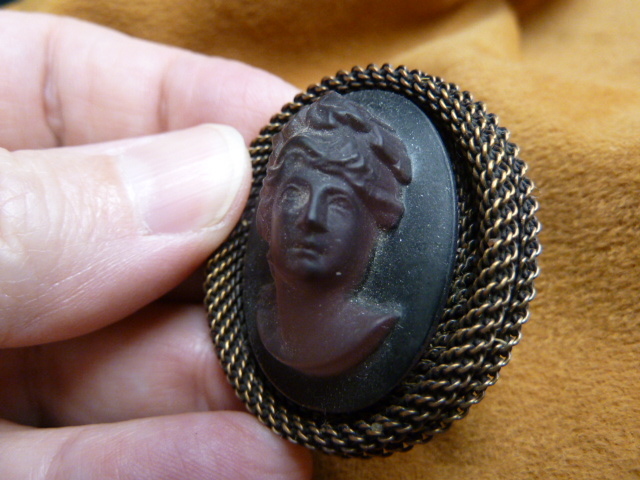 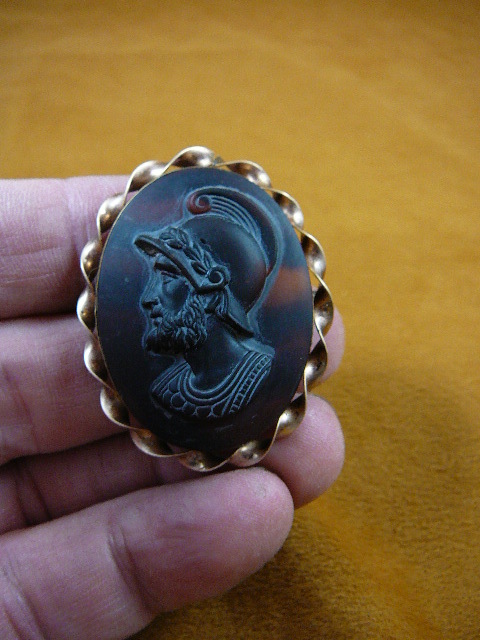 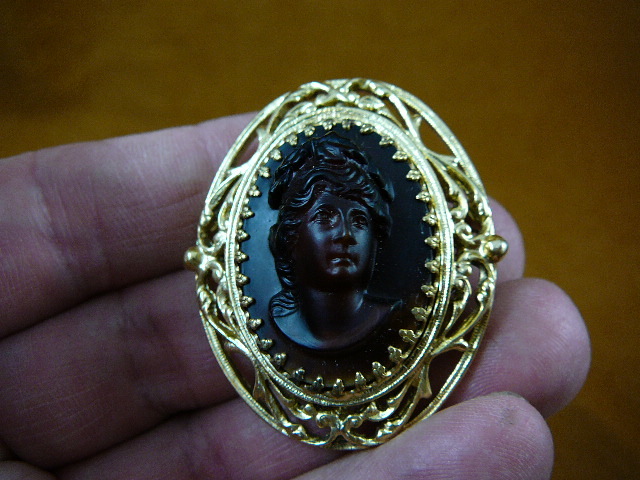 Vintage 1950's synthetic black & white cameo is re-mounted on triple brass as a pin / pendant, 1-1/4" long. 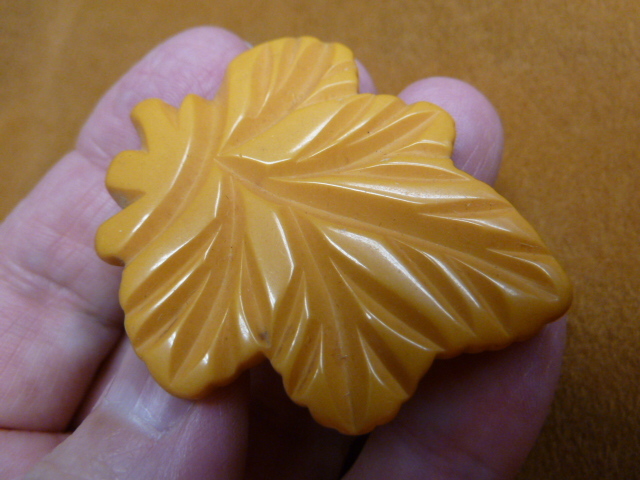 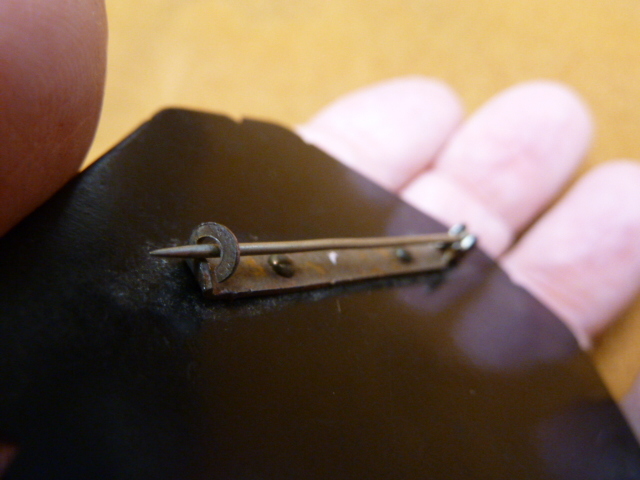 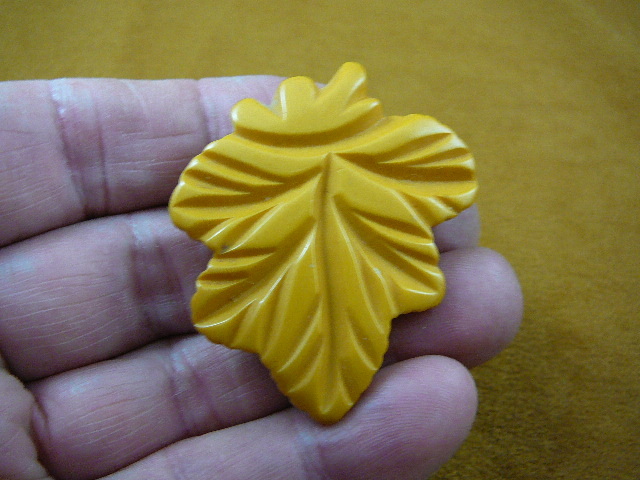 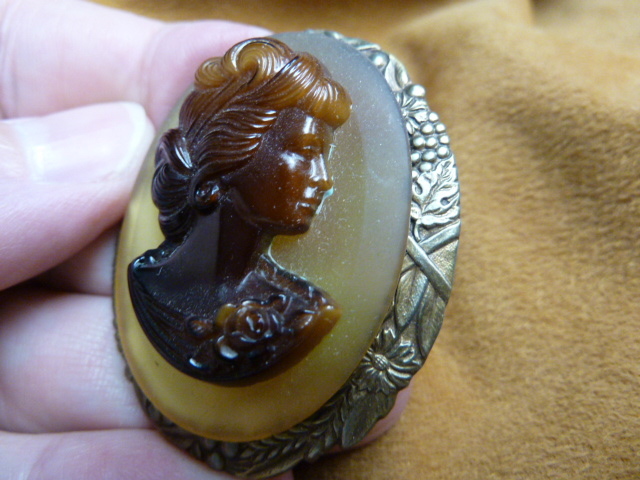 Bakelite on brass, original, pin is 1-1/2" long. 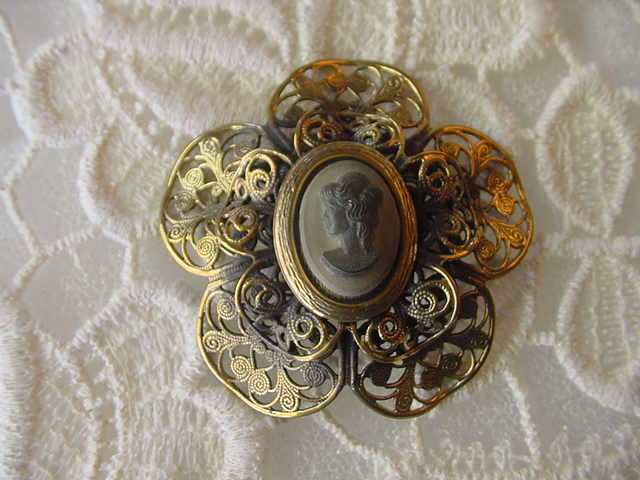 Beautifully colored with red roses and green and yellow flowers around edge, textured. 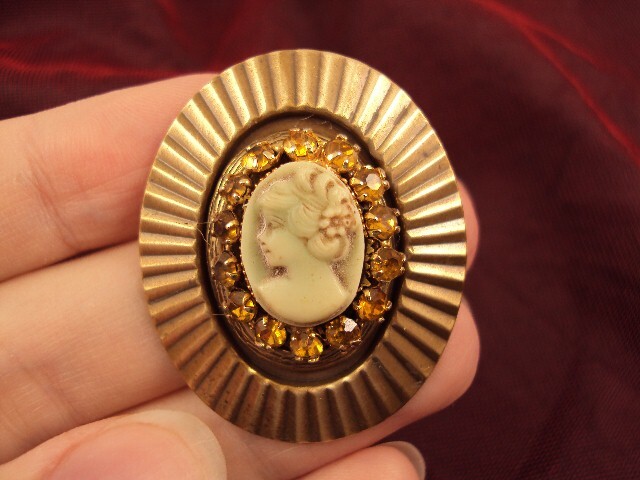 Lady with flower in her hair cameo, has been re-mounted on amber rhinestone vintage setting and on a repro Victorian brass sunburst setting as a pin/pendant, 1-1/2" long. 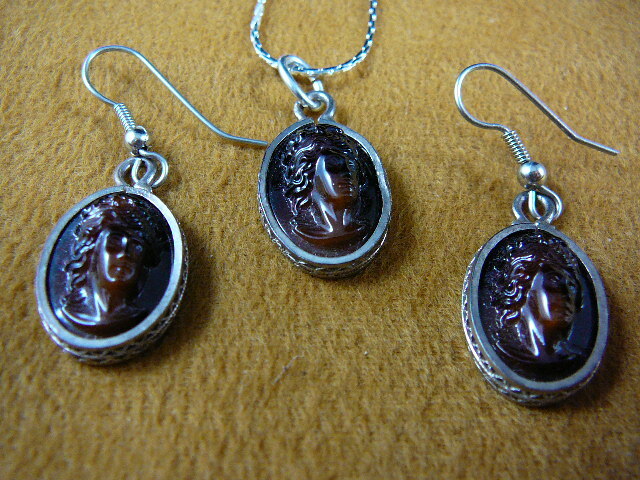 Molded brown glass, redesigned, matching pendant and earrings in sterling, small dent in pendant sterling are 1" long each. 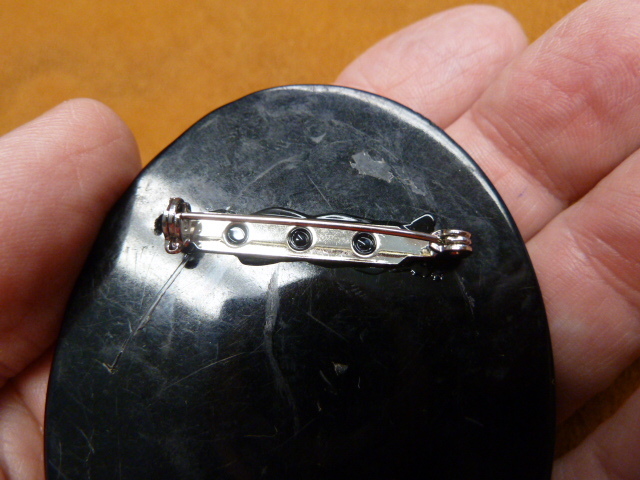 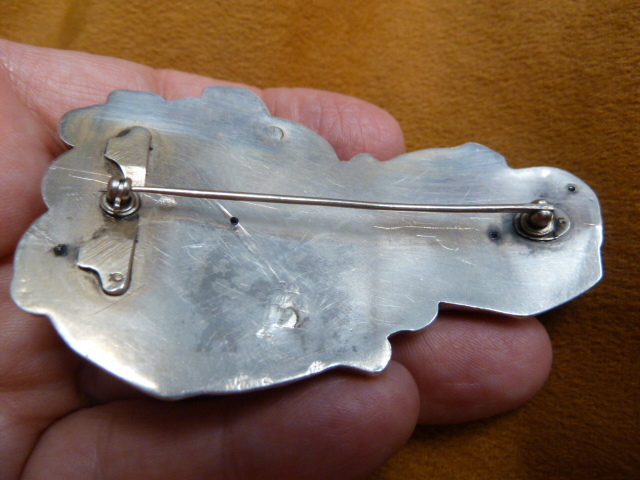 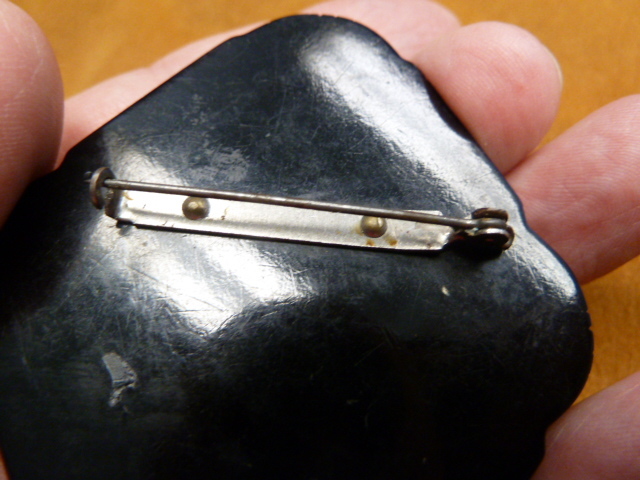 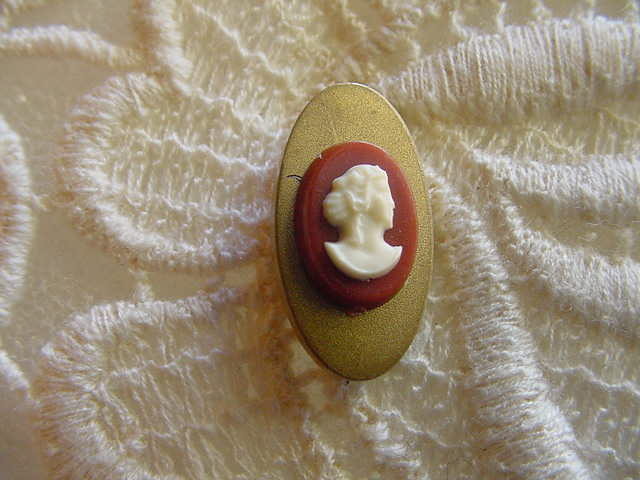 Celluloid and vintage brass pin, redesigned, small scratch on vintage mount, 7/8" long. 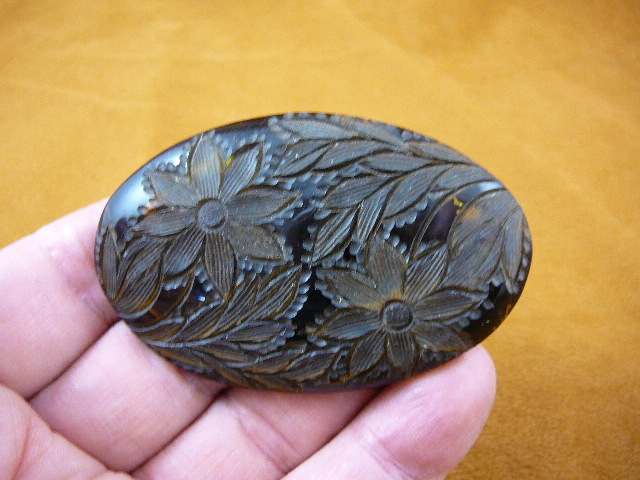 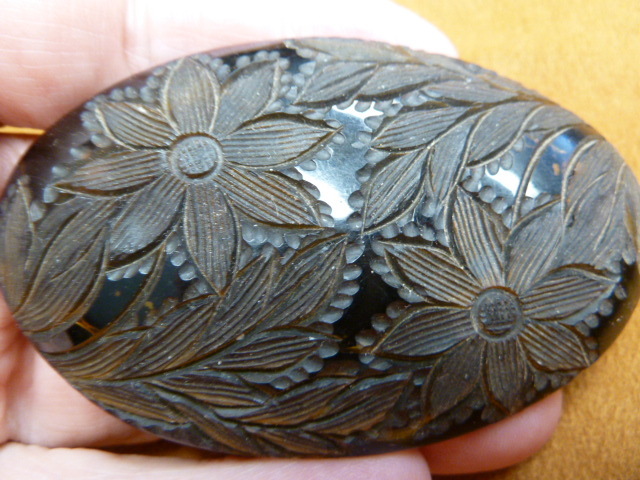 Rare, celluloid & engraved tin with rhinestones, pin, original, 2" long. 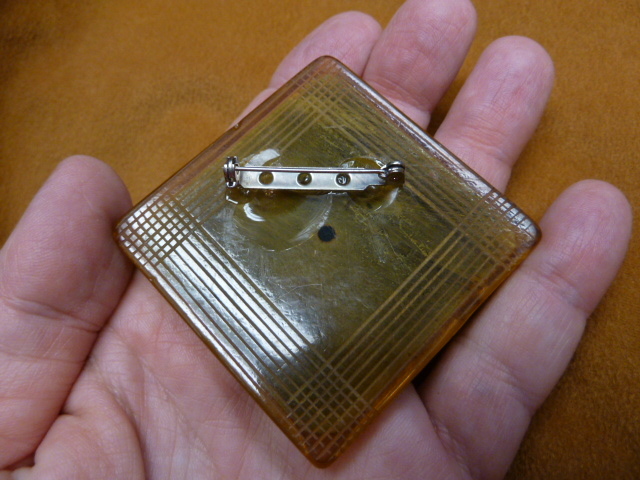 Glass on vintage brass & new brass, redesigned, pin, 1-1/4" long. 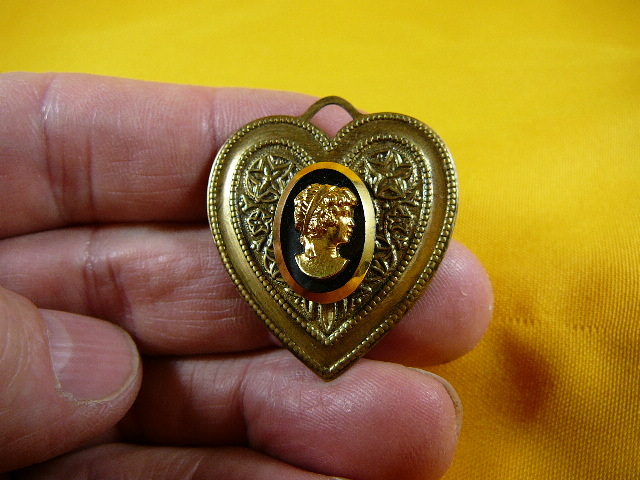 Celluloid & brass, redesigned, pin, 2" long. 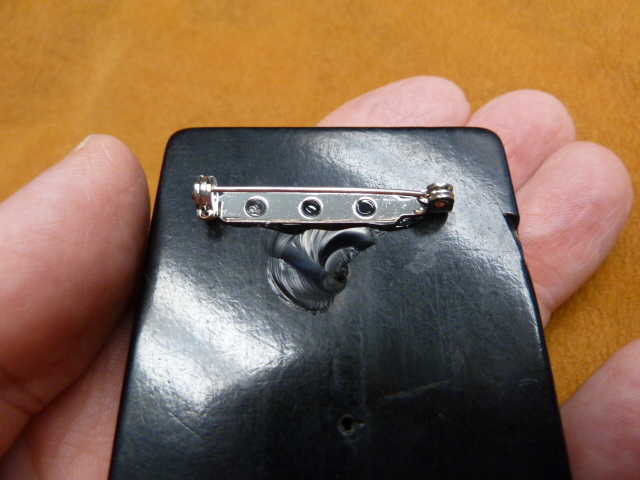 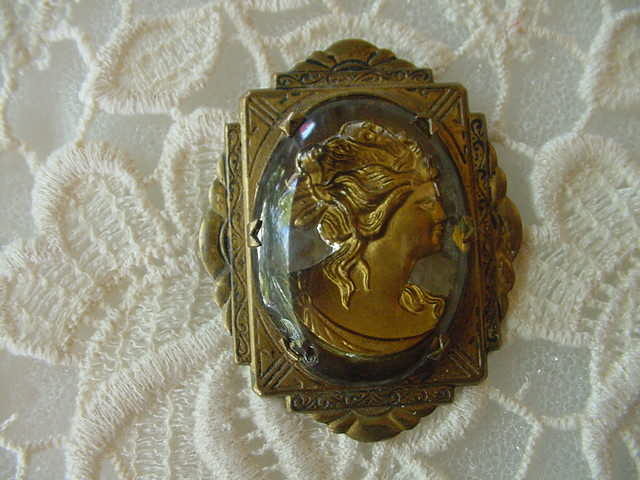 Square celluloid cameo on repro brass, redesigned, 1-1/3" long, pin. 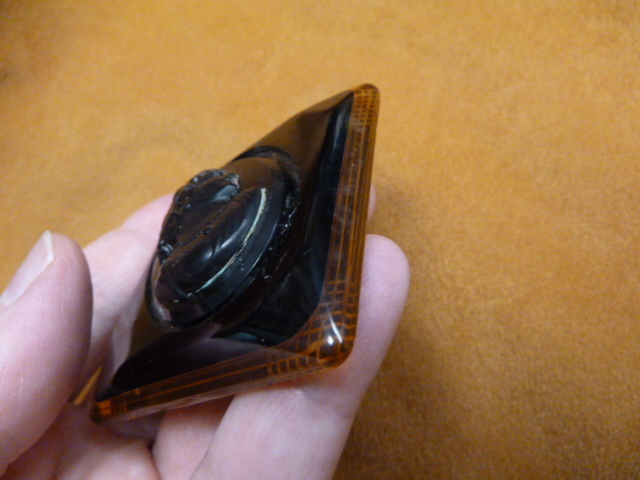 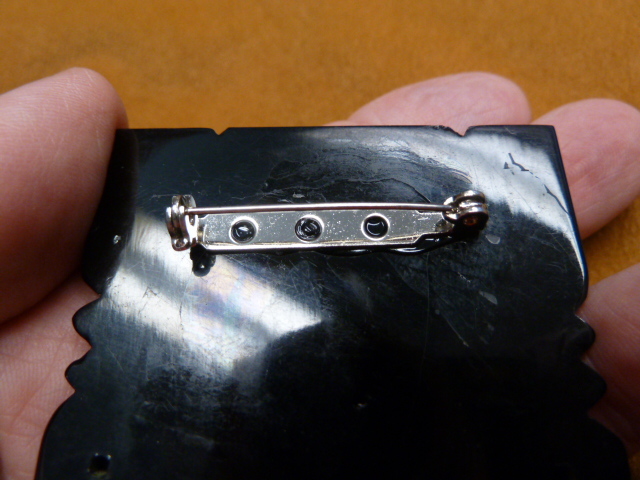 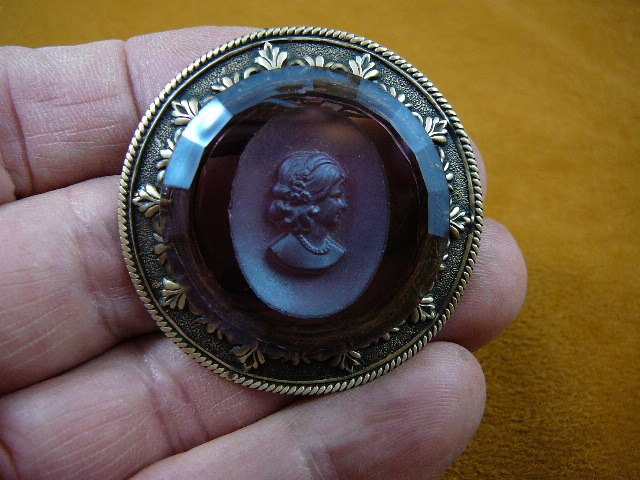 Square celluloid cameo on repro brass on celluloid disk, redesigned, 1-1/2" long pin. 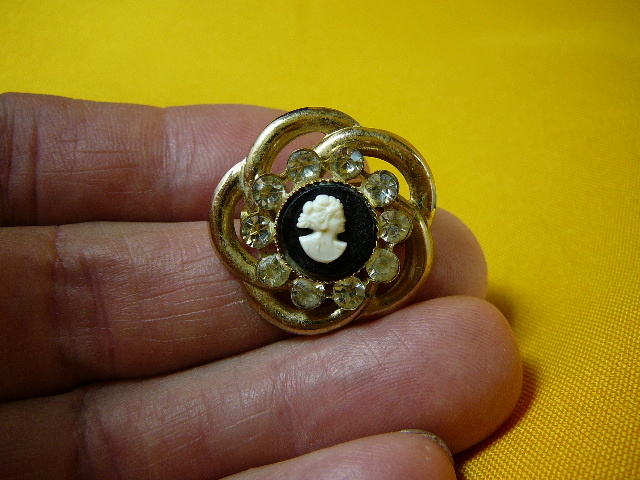 Milk glass on black glass cameo on repro brass, redesigned, 2-3/4" long, pin. 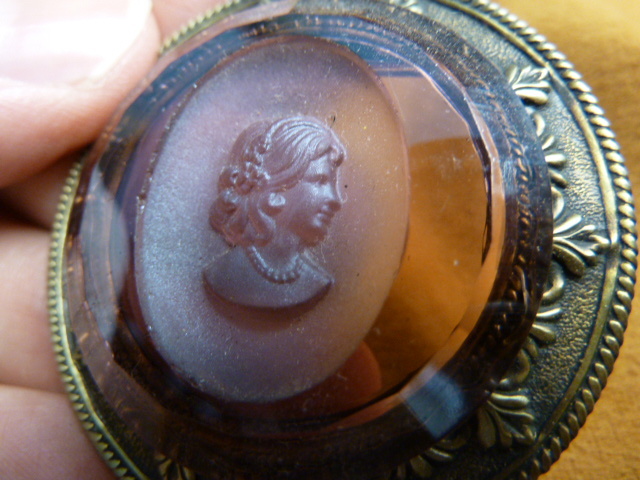 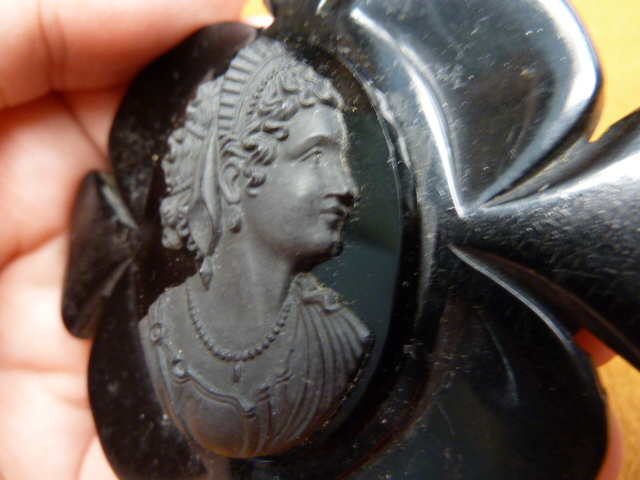 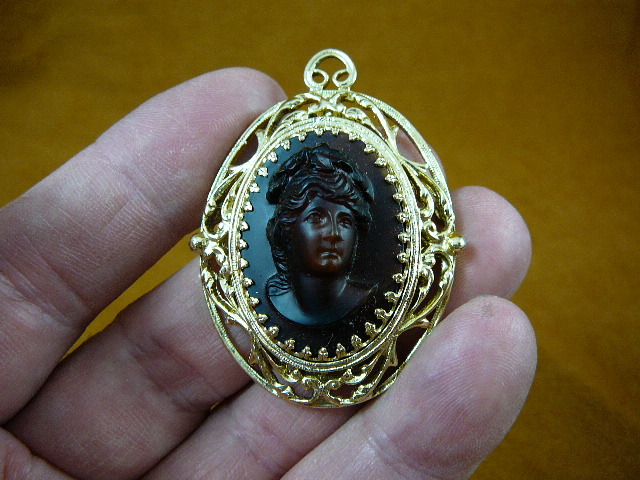 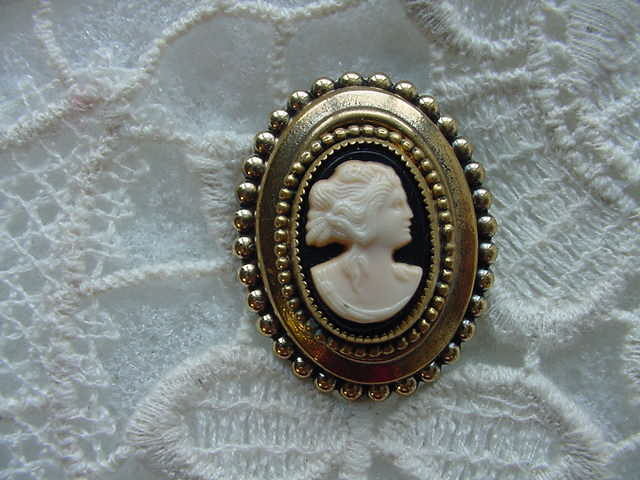 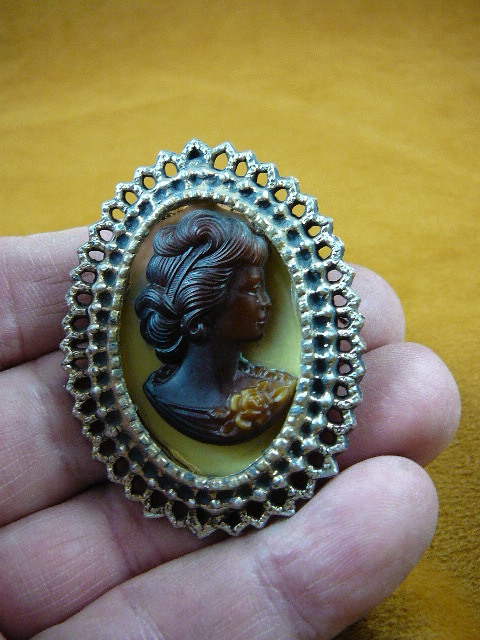 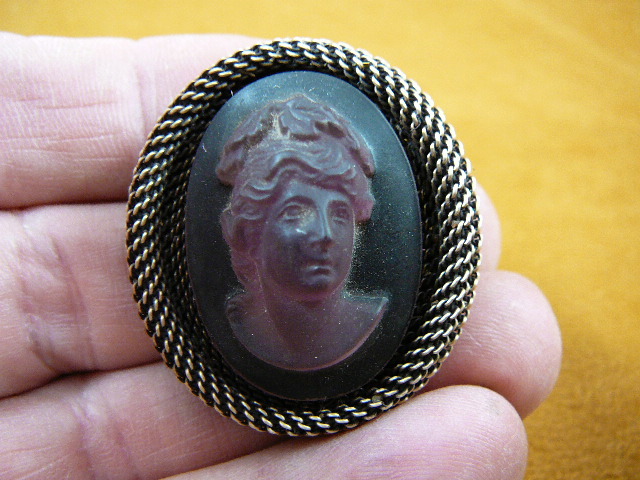 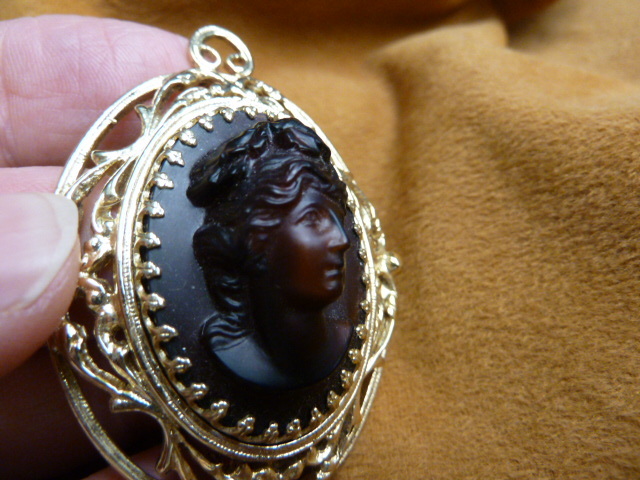 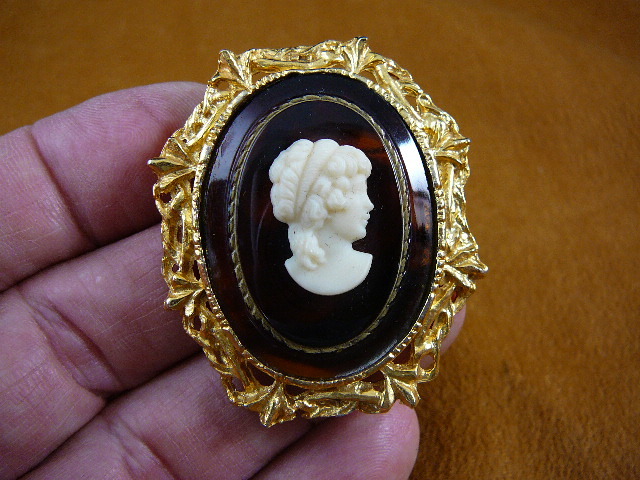 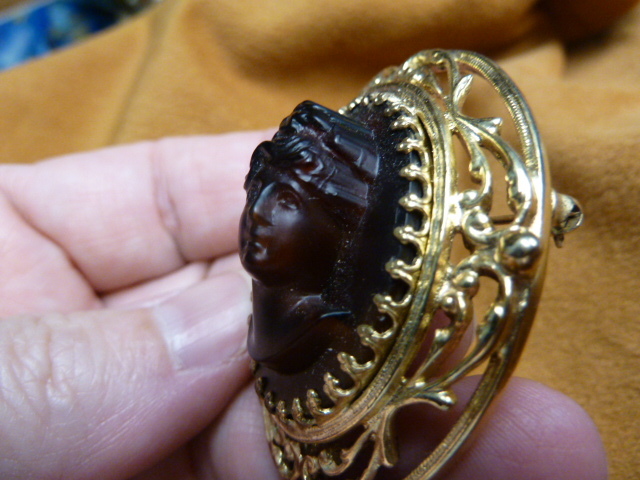 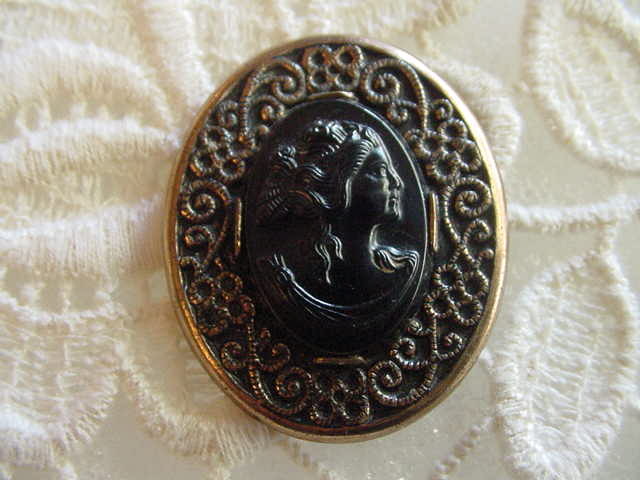 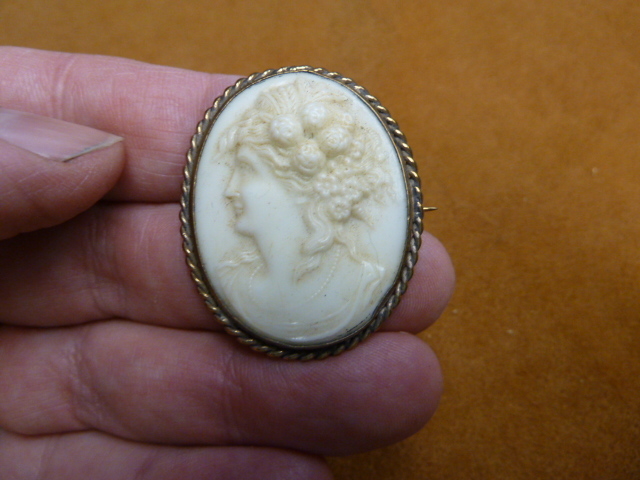 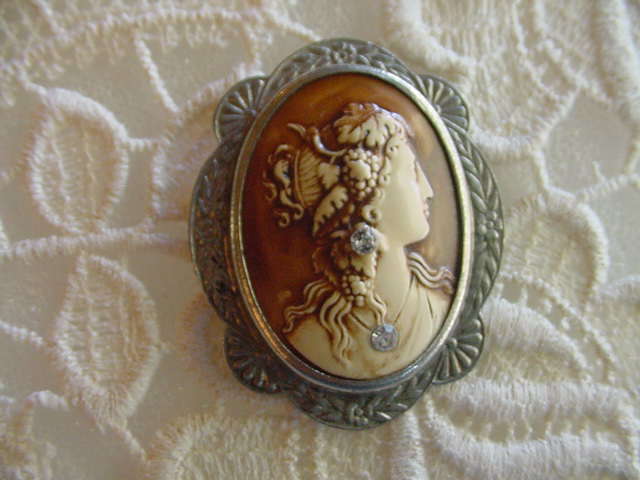 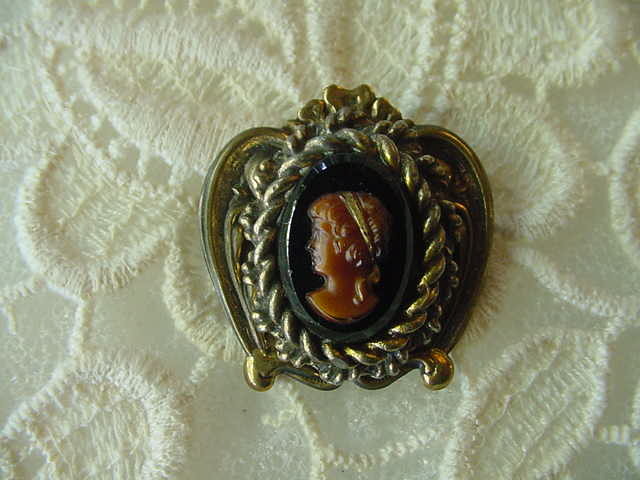 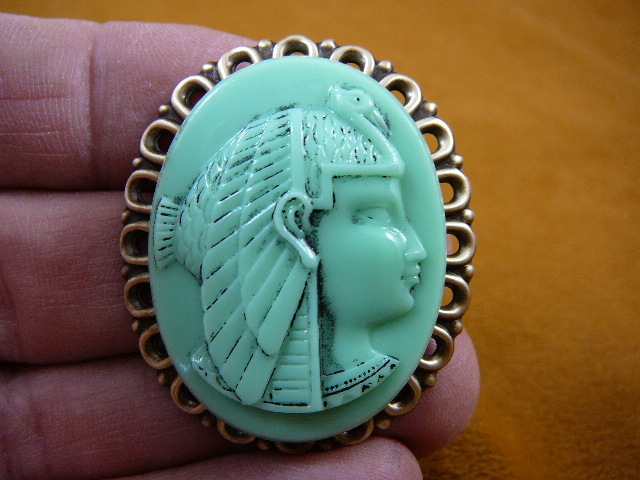 Highly unusual reverse Intaglio glass cameo, lady in gilt, all original, 2-1/4" long pin. 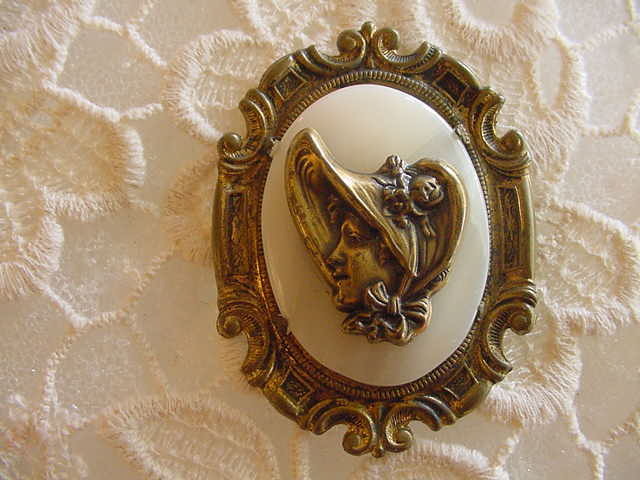 Brass cameo on mother-of-pearl cabochon and on vintage brass, redesigned, 2-1/4" long, pin. 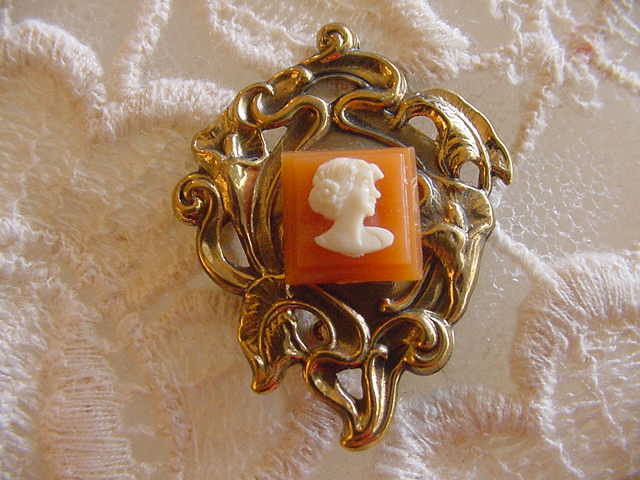 Milk glass on tortoise shell glass on brass, all original, 2" long, pin / pendant. 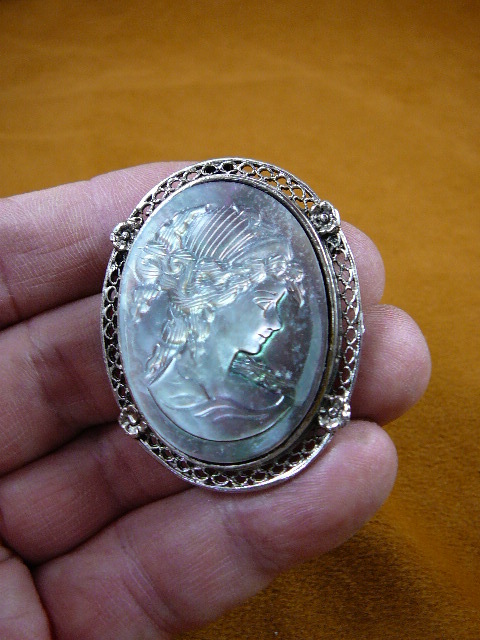 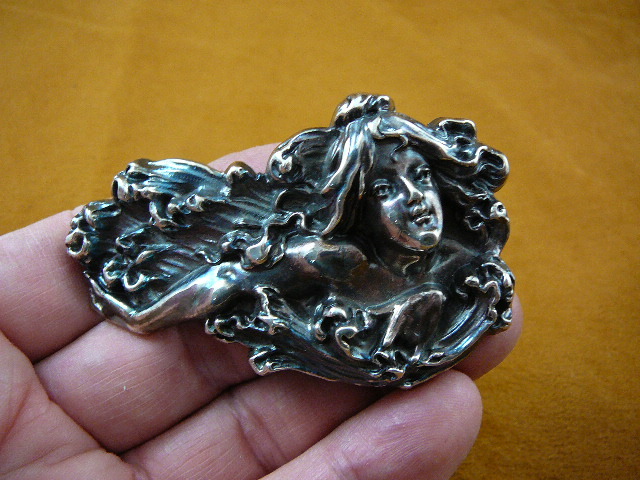 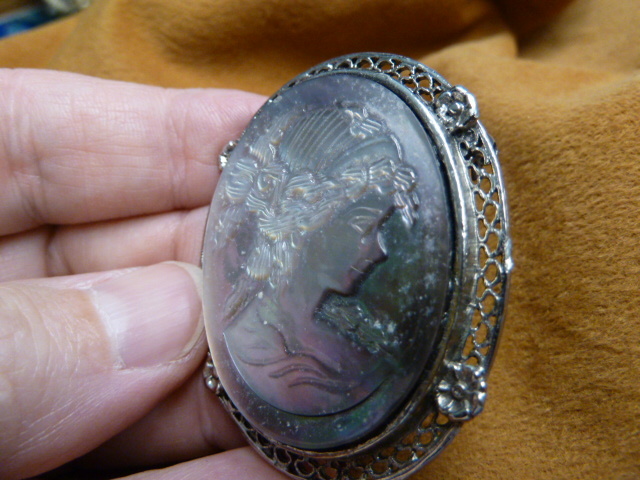 Genuine Abalone/paua shell cameo with feminine lady looking down, hair up, mounted on silver rhodium floral filigree setting, 1-15/16" long x 1-1/2" wide, with clasp pin and pendant loop on reverse. 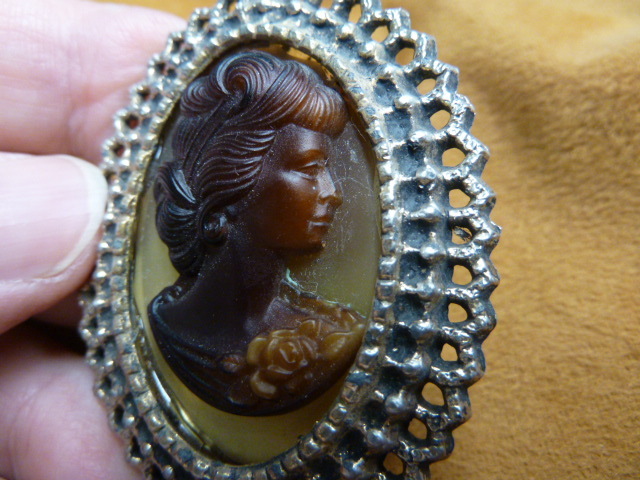 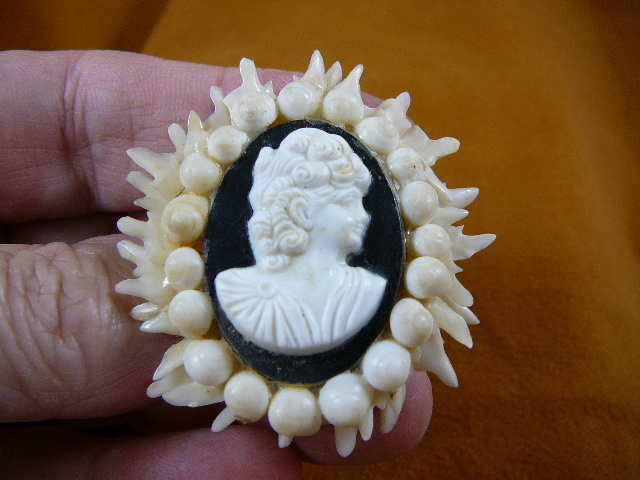 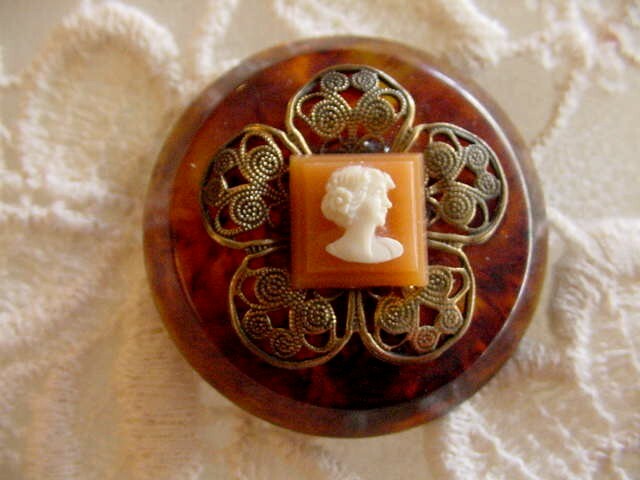 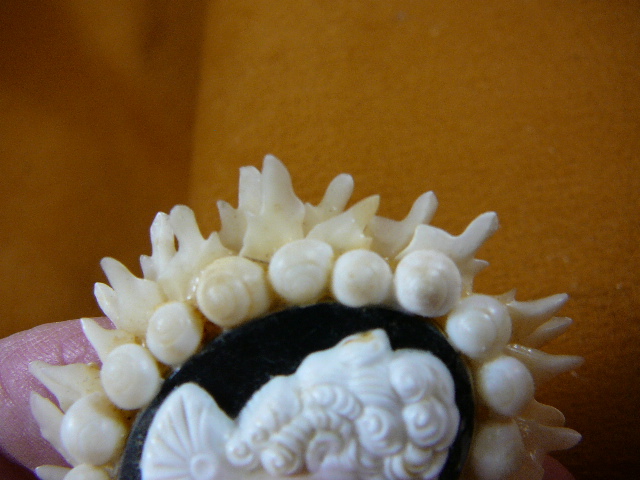 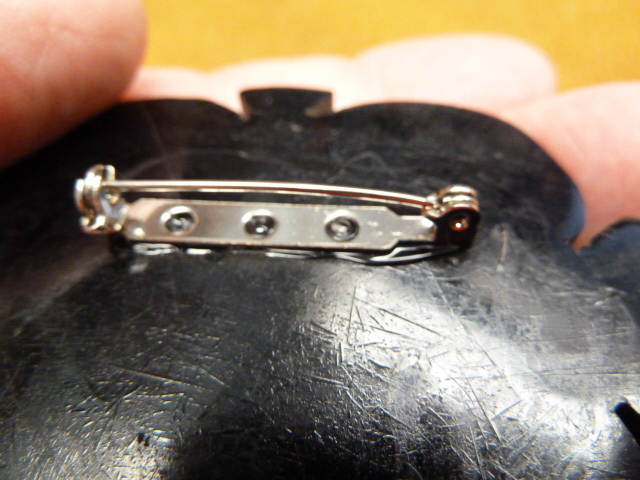 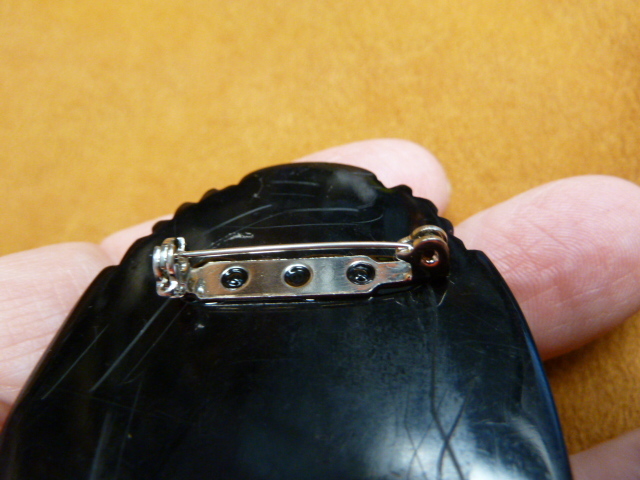 Woman with tiara (matching Bakelite cameo to setting), diamond shaped setting, 2-3/4" long x 2-1/4" wide, original clasp pin on reverse (missing clasp); if you wish this replaced, we can do so at no charge, just ask. 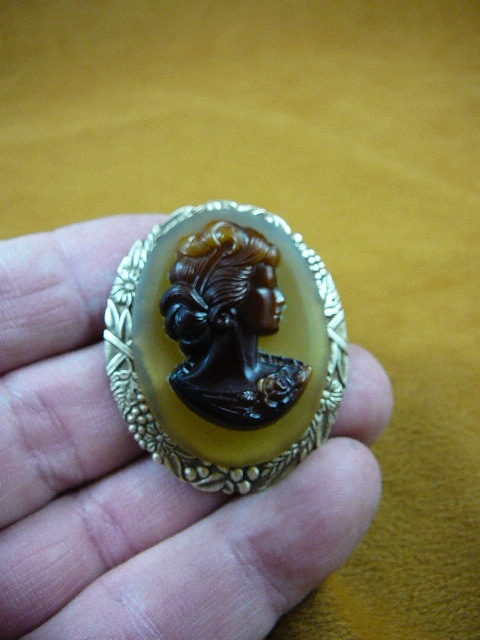 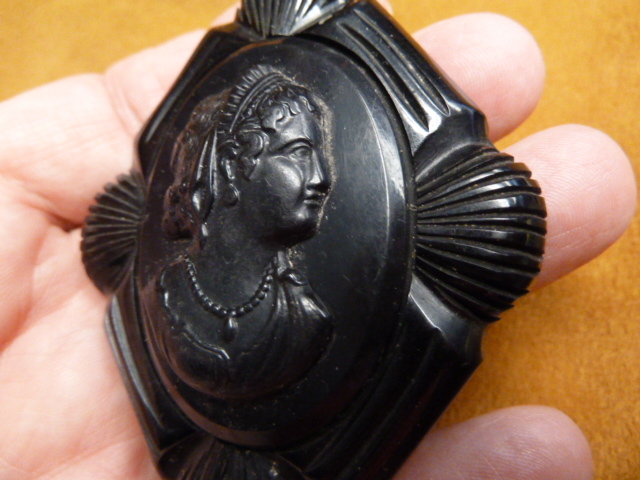 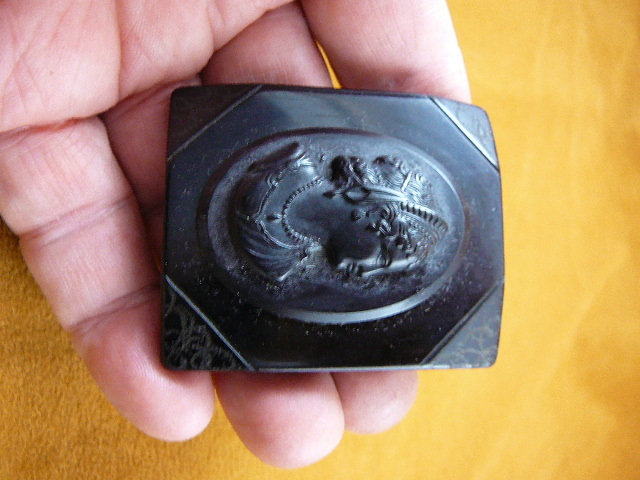 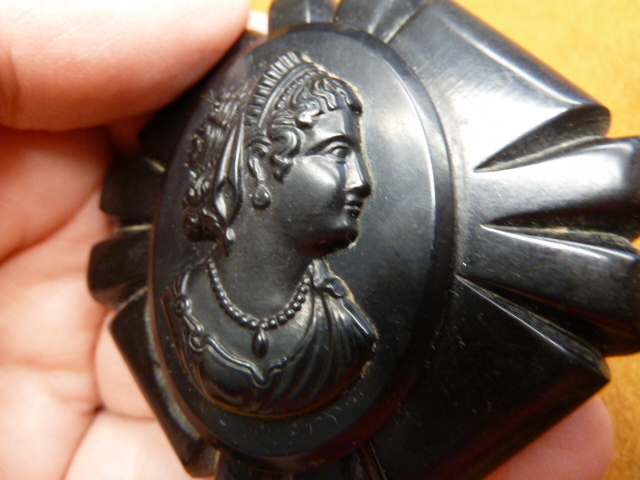 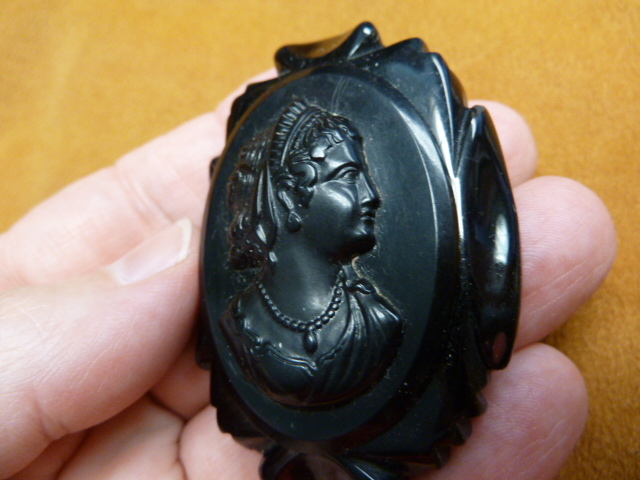 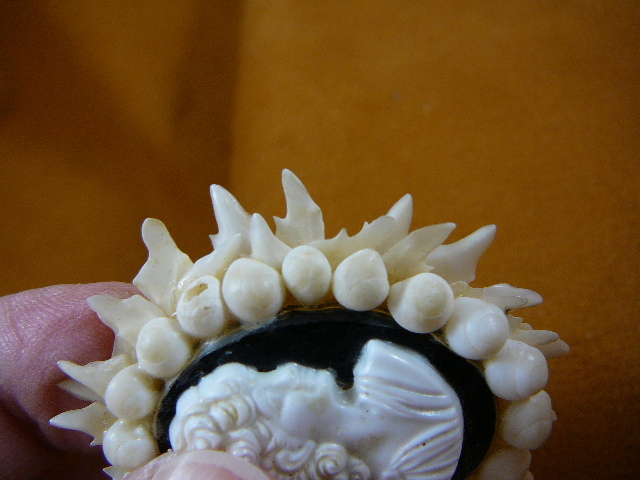 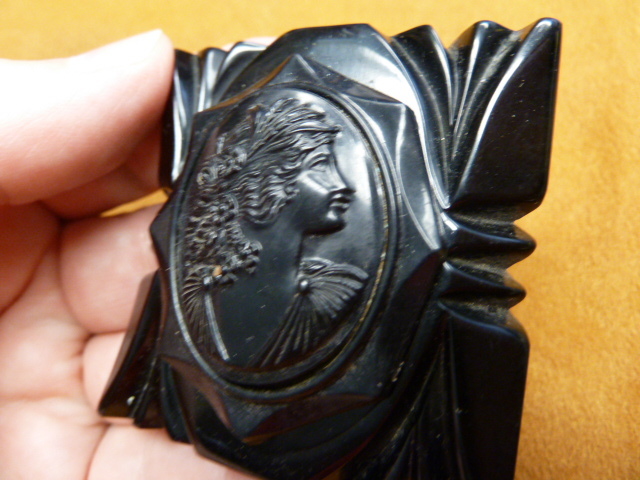 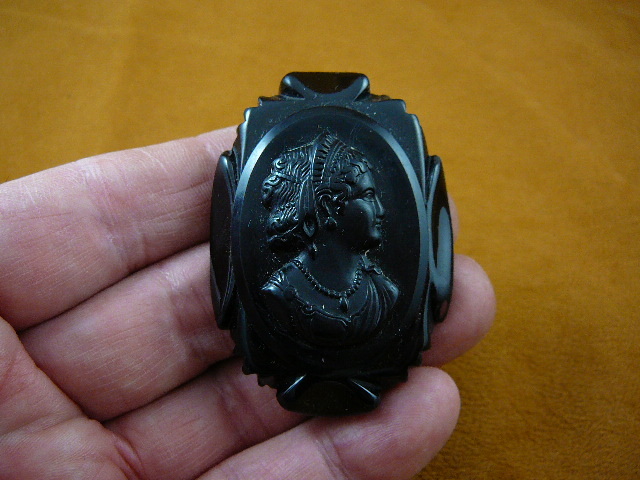 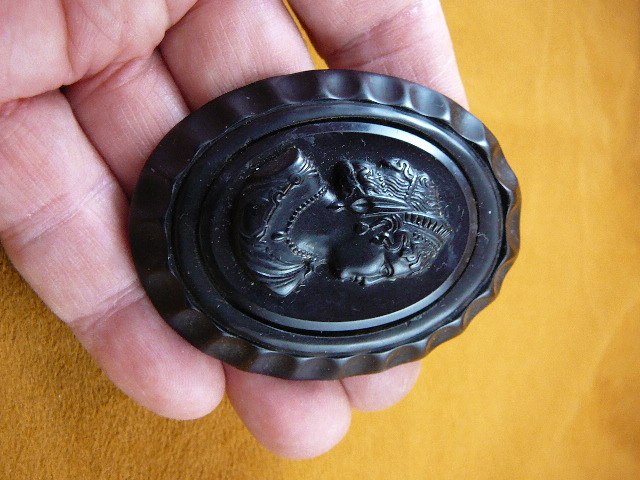 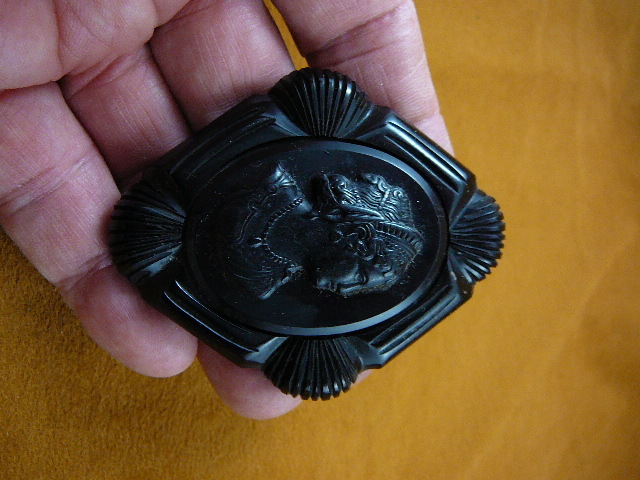 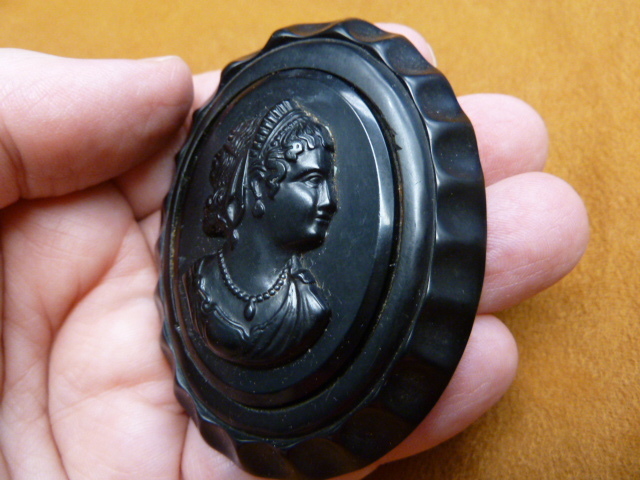 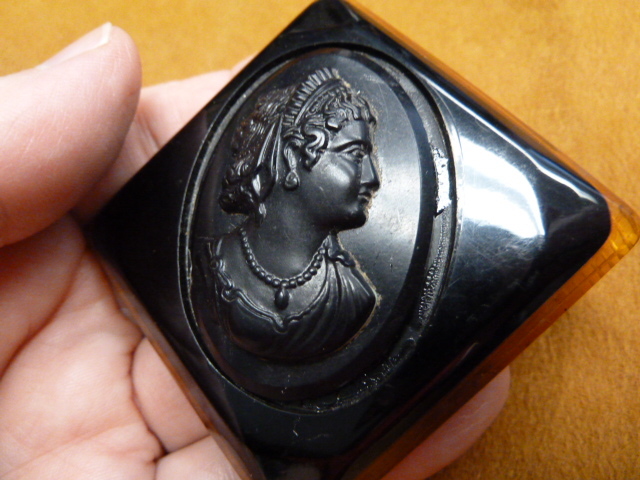 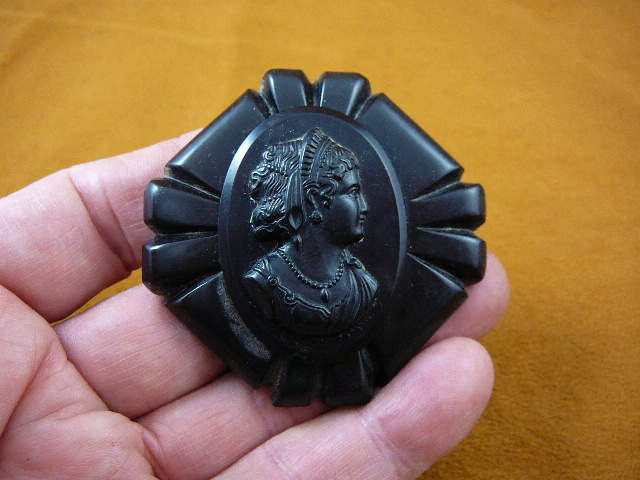 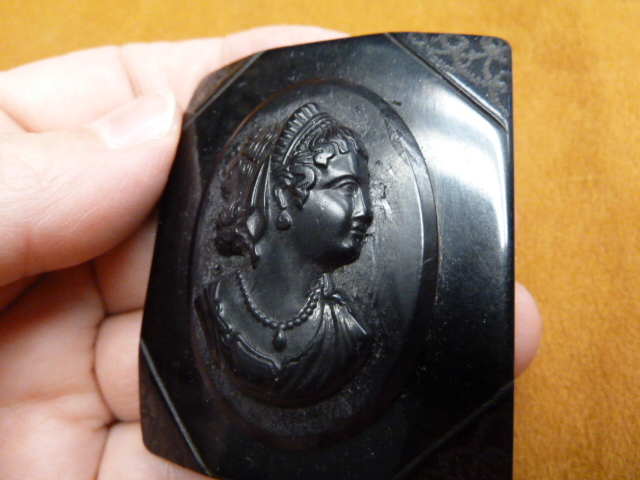 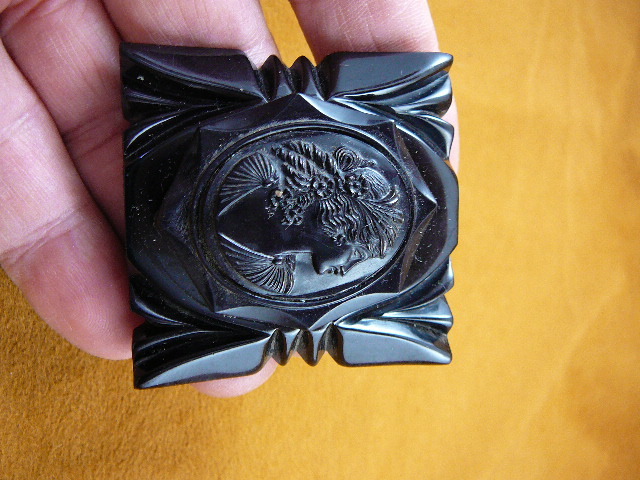 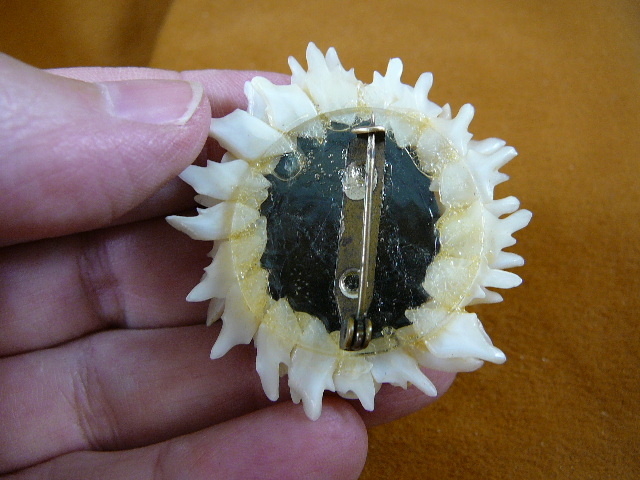 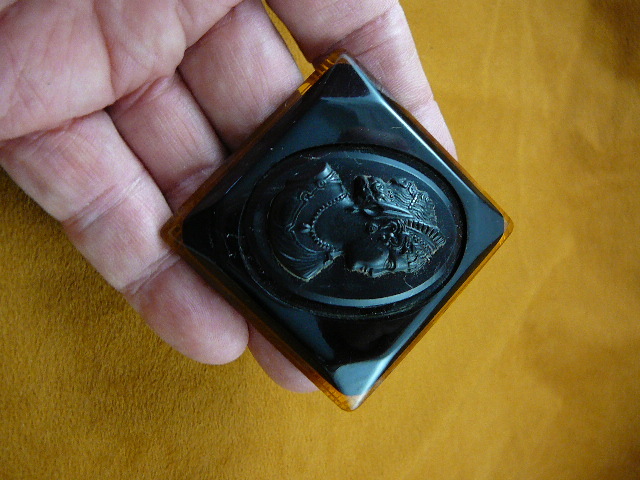 Woman with tiara (Matching Bakelite cameo to setting), square setting one piece black on top, amber line etched on bottom, 3" wide x 3" tall, new clasp pin on reverse, chink out of back of setting under pin.